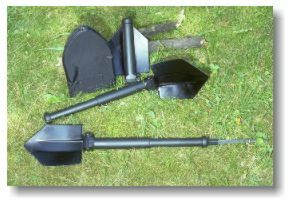 česky | english This versatile lightweight field spade features several tools in one. Telescoping handle is made of shock-resistant durable polymer. Sharpened spade blade is made of hardened steel with black anticorrosive surface treatment. The spade blade can be locked in four positions. There is steel saw with screwdriver tip stored in hollow handle. No rivets, no welds, extremely durable tool.